Moroccan Ammi Visnaga Essential Oil is gaining recognition as one of the best essential oils to use to help control or minimize asthma attacks. Within her Aromatherapy Practitioner Reference Manual, aromatherapy expert and instructor Sylla Sheppard-Hanger denotes that Moroccan Ammi Visnaga Essential Oil is a bronchial dilator that can be especially helpful in helping to control asthma and bronchial spasms. 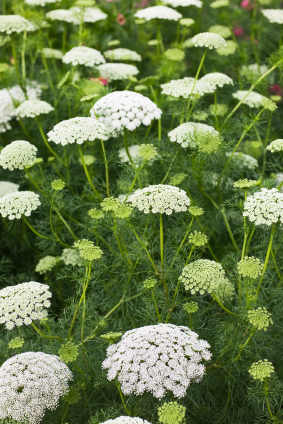 She states that Moroccan Ammi Visnaga lowers blood pressure, thins blood, and can help alleviate nervous tension and stress. Our Moroccan Ammi Visnaga Oil possesses a unique earthy, herbal and slightly floral aroma. The oil is phototoxic and should not be used in topical formulations if you will be exposed to the sun within 12 hours of use. We agree with Sylla Sheppard-Hanger that Moroccan Ammi Visnaga Essential Oil should be avoided with children, if pregnant and avoided with blood thinning applications.Steam distilled wild Moroccan Ammi Visnaga essential oil from Morocco. Also known as Khella oil. Moroccan Ammi Visnaga, also called Khella essential oil, is steam distilled from the seeds of the khella plant, which grows in Morocco. Amni Visnaga is not purchased for its aroma; when steam-inhaled, it is a powerful antispasmodic and thus is used to treat bronchial asthma and bronchitis. It also is used to control allergic reactions, because it prevents the release of histamines.Moroccan Ammi Visnaga, also called Khella essential oil, is steam distilled from the seeds of the khella plant, which grows in Morocco. Amni Visnaga is not purchased for its aroma; when steam-inhaled, it is a powerful antispasmodic and thus is used to treat bronchial asthma and bronchitis. It also is used to control allergic reactions, because it prevents the release of histamines. Moroccan Ammi Visnaga, Morocco, Wild crafted from the seeds of the Khella plant.Ammi is a powerful bronchial antispasmodic which can lead to freedom from allergic bronchial asthma. All my sources indicate that, inhaled, it can be a powerful weapon against asthma, especially bronchial asthma. Any essential oil can trigger an asthma attack, more or less at random, among those who suffer from this disease, however, Amni Visnaga appears to actually ease the attack away, by both relaxing the bronchial spasms and dilating the bronchia. For this reason, inhalation could prove helpful for both asthma and bronchitis. Contraindications: Can cause photo sensitization (sunburn) when used externally undiluted. Must be diluted with a carrier oil (no more than 3%*) before applying to the skin. Ammi Visnaga works best when used in a diffuser for inhalation therapy. *According to Organic Infusions website.